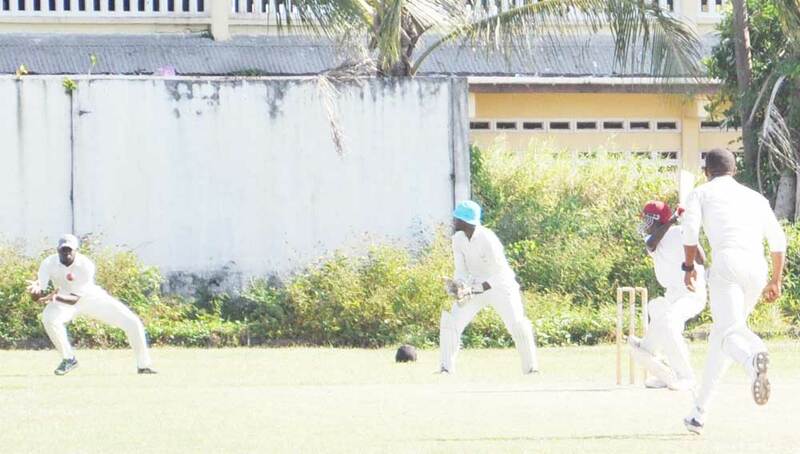 In the two opening matches in the Georgetown Cricket Association’s (GCA) New Building Society (NBS) 40-overs division-two cricket tournament played yesterday, Malteenoes Sports Club (MSC) defeated Muslim Youth Organisation (MYO) and Transport Sports Club (TSC) got the better of GNIC. Mark Smith is about to be dropped by Kareem Naughton to deny Edwin Burnett a 5-Wkt haul at MSC yesterday. At MSC, the hosts were spearheaded by a useful all round performance from pacer Edwin Burnett (38 & 4-17) beat MYO by 123 runs after MYO made 80-8 innings closed in reply to MSC’s 163 from 28.5 overs as teams failed to bat out 40 overs. Burnett exploited a track with some grass to start the slide bowling Imran Ayube for a duck with the fifth ball of the innings as only Abdul Khan (13) reached double figures before he was also removed by the talented Burnett. Shaquille Mosley (3-7) and Wicket-Keeper Kefa Naughton who held two catches, effected a stumping and a run out, offered good support to Burnett who was denied a five-wicket haul after Kaveem Naughton at slip dropped Mark Smith off his bowling. Earlier, MSC were piloted to their total by a 59-run ninth wicket stand between number 10 batsman Burnett, who smashed three sixes and two fours in his explosive 38 and Floyd Rawlings who stroked a subdued 26. But Kaveem Naughton (19) and Steven Sankar (15) reached double figures as most of the batsmen perished due to poor shot selection. New ball pair of Raj Lall (3-39) and Shiv Sankar (2-22) dismantled the top order while left arm spinner Parmanand Parsram (2-17) polished off the innings despite the lower order flurry from Burnett. And at GNIC where sixes were only scoring by clearing the straight boundaries which four runs being scored square of the wicket despite the distance the ball travelled, Sunil Singh hammered 10 fours and a six in a commanding 77. But only Keon Morris (18) and Joshua Wilson and Azeez who made 17 each put any resistance to Ryan Shun (3-51), Delroy Charles (2-29) and Andrew Chung (2-23) as TSC made 161 all out in 37.2 overs. When GNIC batted Kurt Lovell (28) and Chung (25) give them a half century opening stand but once off-spinner Azeez, who flighted the ball nicely, got rid of both openers in the same over, GNIC slipped from 57 without loss to 144 all out in 34.3 overs despite Shun’s 24, Jermaine Grovesnor’s 26 and Shaun DeSousa’s 22. Azeez (4-29), Wilson (2-19) and Mark Baptist (2-27) were the main wicket takers for the Thomas Lands team which is still handicapped by the unfit condition of their ground.